Troy Olsen and Dana Ramos riding the Grand Traverse Trail during the Wydaho Rendezvous Mountain Bike Festival. Mt. Owen is on the left and the Grand Teton is on the right. Photo by Mark Fisher. If you haven’t mountain biked in the Tetons, you are missing out on a hidden gem in the mountain biking world. At least this is what the Wydaho Rendezvous Mountain Bike Festival’s original founders thought when they started the event 5 years ago. 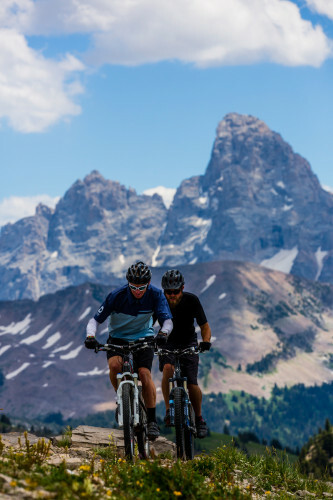 With its wide variety of terrain, dramatic views, cool mountain temperatures and uncrowded trails, Teton Valley Trails and Pathways knew that Teton Valley needed some much-deserved attention as a mountain biking destination. With that mission in mind, the Wydaho Rendezvous Festival was born. Fast forward 5 years. Teton Valley and Grand Targhee’s incredible trail network is no longer as big a secret (although the trails are still empty), the festival has grown bigger and better, Grand Targhee has built and rerouted countless miles of cross country and downhill trails, there are now 3 full-service bike shops in Teton Valley and the area has become known for a reason. The festival is now hosted and centered at Grand Targhee Resort in Alta, Wyoming and held over Labor Day weekend. The 5th annual Wydaho Rendezvous Mountain Bike Festival kicks off at noon on Friday, August 29 and continues through Monday, September 1 at noon. Held over Labor Day weekend and based at Grand Targhee Resort, the Wydaho Festival boasts a weekend of amazing trail riding in a family friendly, laid-back, mountain festival atmosphere with activities and trails for riders of all ages, riding styles and abilities. It’s also a fundraiser for Teton Valley Trails and Pathways, the local trails and pathways organization. The group’s goal is to build and maintain a complete, connected network of pedestrian and bicycle pathways and trails throughout Teton Valley. The festival should appeal to all types, from hard-charging downhillers to beginner cross-country riders. There are nearly 20 group rides, hosted by knowledgeable locals, held all over the valley, at Targhee and on Teton Pass downhill and cross country trails. There are skills clinics for all abilities, ranging from women’s only clinics taught by pro rider Amanda Carey, to intro to downhill and even a kid’s only ride. Ripstoke, a Colorado-based group of trials riders, will wow the crowd with massive box drops, spins and other mind-blowing trials moves on Saturday night. There’s beer from Snake River Brewing on tap, BBQ and food available all weekend and the Targhee chairlift spins daily to take riders up to both blue and black diamond trails. There are also huge product raffles every evening, live music from West Water Outlaws and Jonathan Warren & The Billy Goats, kid’s races and games, Strava races, the infamous Targhee Super D, silly shenanigans like the Fat Bike Keg Pull and the Chainless Downhill and the festival’s biggest attraction, 2015 demos from major bike manufacturers. This year, festival goers can enjoy testing the latest and greatest 2015 bikes from Pivot, Specialized, Giant, Yeti, Rocky Mountain, Santa Cruz, Juliana, Trek, Niner and wheel and cockpit demos from Enve. Demos are included in the festival pass and can be taken on the Targhee XC trails or up the chairlift. There is camping with showers available at the base of Grand Targhee as well traditional lodging options there and in the valley. For complete information, registration prices and event schedules, visit the festival website at tetonmountainbikefest.tvtap.org.